QuikQuak has updated its Fusion Field diffusion reverb effect plug-in to version 3.1. 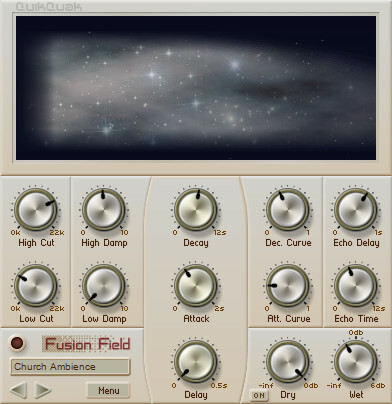 Fusion Field is a smooth diffusion reverb that sits beautifully in a mix. 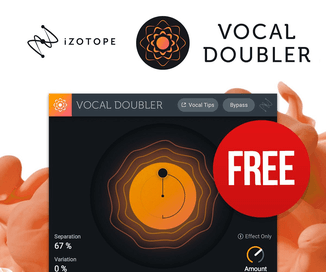 A clean, unobtrusive sound with a natural falloff that floats and complements the source material perfectly. Designed to imitate complex, natural spaces, it is also very easy to use. The main ‘cloud’ display represents the reverb in terms of time and frequency, showing all the main parameters and EQ in a natural way. The reverberation can be dampened in the upper and lower frequencies, allowing soft sibilance and a graceful, lifting air to the sound. Stereo cross feed system for altering output mixes. 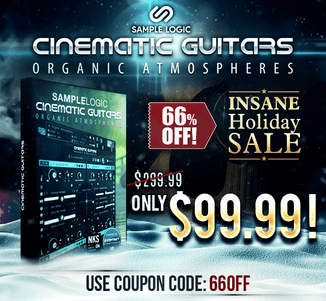 This can move the outputs towards a mono reverb in a stereo mix, or negatively cross the channels for a more open and realistic reverb. CPU optimisations and overall audio rendering performance increase on Macs. No more waiting for reverb construction. Audio parameter editing while ‘Logic Pro’ is in zero processing mode. Stereo level metering, and parameter value display. 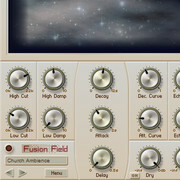 Fusion Field is available to purchase for PC and Mac (VST/AU) for £50 GBP.